From the authentic flavours of the cuisine to the laid-back intimacy of its warm interior Mogador is a feast for each of the senses. Countless lanterns hang from the ceiling, Arabic proverbs adorn the walls and intricately woven cushions provide comfort and texture in an exotic dining venue. Opened recently, this charming establishment promises to become a firm favourite for the locals and tourists alike. Offering an attractive array of dishes that invoke the mouth-watering flavours of the Mediterranean cuisines, all food is prepared to order from fresh ingredients. In the true fashion of Lebanese and Middle Eastern restaurants, you can finish with a Shisha, and if lucky, be entertained by the enticing belly dancer. Mogador, the most southern seaport on the Atlantic coast of Morocco, is a natural fortress, an enclosure that has long served as home and refuge for the Berbers and Arabs of the Maghreb. The principal flavours of the region are cumin, cayenne pepper, cinnamon, saffron and �Ras-el-hanout�. The restaurant offers a private room that can be hired on its own for a party of up to 20 people, or joined to the main restaurant to host a party of 60 people. 30% discount when you book online. Live music and belly dancing every evening. Lebanese cooking is about freshness and purity of ingredients, seeking to capture the highest level of flavour. The food is simple and reflects its Mediterranean origin of sun, earth, and sea. Mogador has stayed true to these principles, and offers the best of Lebanese cuisine in a warm and friendly environment. 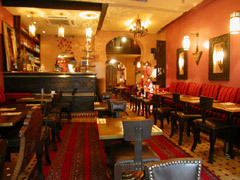 The menu includes choices of cold and hot Mezze, and a good selection of meat and vegetarian main courses. Is home to one of the world's great cuisines. Redolent of saffron, cumin and cilantro, Moroccan cooking can be as elegant or as down-home hearty as you want it to be. There is a whole range of delectable recipes that embody the essence of the cuisine. From Morocco's national dish, to delicacies such as Bisteeya (a pigeon pie made with filo, eggs, and raisins among other ingredients), Hearty and spicy or heady and fragrant, Moroccan food exudes exotic aromas and full piquant flavors.